We Are Premium Quality Equipment Manufacturer And Solution Provider. We Offer Packaged System ForConveying/Feeding Cement/Fly AshInto Silos At Batching Plant Sites. These Systems Are Synonymous With Modern And Efficient Construction Industry Practices Contributing To Improvement In Technique And Efficiency. Features Noiseless & Zero Maintenance Working Performance. We Are Premium Quality Equipment Manufacturer And Solution Provider. We Offer Packaged System For CONVEYING/FEEDING CEMENT/FLY ASH Into Silos At Batching Plant Sites. These Systems Are Synonymous With Modern And Efficient Construction Industry Practices Contributing To Improvement In Technique And Efficiency. 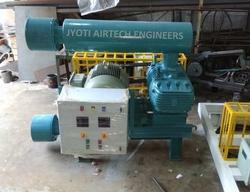 1) Cement/ Fly Ash Unloading Blower (Roots Type) -1 Nos. 2) Complete Accessories for mounting Blower & motor with Baseframe. 3) Standard electric Motor - 1 Nos. 4) Standard Electric Control Panel -1 Nos. 5) Rubber Hose Pipe With Flange Fitting. - 2 Nos. Packaging Details: As Customer Requirement we are offering wooden box packing for material. Cement/ Fly Ash Unloading Blower (Roots Type) -1 Nos. 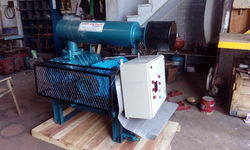 Complete Accessories for mounitng Blower & motor with Baseframe. Standard Elelctric Motor - 1 Nos. Standard Electric Control Panel -1 Nos. Rubber Hose Pipe With Flange Fitting. - 2 Nos. 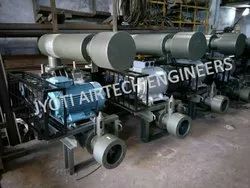 With our rich industry experience, we manufacture and supply an extensive range of Fly Ash Conveying System that has a wide range of applications in construction industry. Our offered feeding system is manufactured by utilizing optimum quality components and advanced technology in line with the set industry standards. Our professionals test the entire range of this feeding system on different quality parameters before dispatching it. Complete Accessories for mounting Blower & motor with Baseframe. Standard electric Motor - 1 Nos. Looking for “Bulker Unloading Units”?